When it comes to wardrobe & fashion, many guys don't realize that clothing does indeed "make the man." What you wear is just as important to others as to yourself. To be taken seriously in today's society, a first impression does matter. Significantly. If you want to be noticed favorably by both women and men, we've got some basic fashion and style tips to help you dress up to your potential. Keep in mind, even the most expensive clothing line won't flatter you if you slouch. Stand up straight and carry yourself with pride. If you respect yourself, others will too. Why not look good today, instead of some unspecified day in the future, when you gain or lose a few pounds -- and will it really happen? When you're shopping, buy clothes that are comfortable. If you need something altered, visit your tailor. Take a good look in the mirror and you'll begin to understand what colors and styles look the best on you. It's OK to try something new, but classics outlive trends. Don't wear soiled or wrinkled clothes. Stick to fabrics that resist wrinkling or learn how to use an iron. 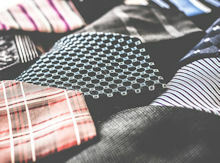 Suits and formal wear should be taken to the dry-cleaner to be cleaned and pressed. It's best to stay away from horizontal stripes, unless your tall & lean. Most stripes are unflattering, and the horizontal ones add bulk, can make you appear heavier, and shorter. Solid colors are a good choice and dark, solids will make you look slimmer. Loud, bright colors and patterns can make you look ridiculous. You can't go wrong with basic black and navy blue for work or casual, it's classic for a reason. You can add other attractive colors for a perfect match. Don't be stuck in the "good ole days." If it's out of style, don't wear it anymore. If you can't imagine parting with it, store it. Trends run their cycles and you may once again be able to wear your favorite garments, but only when they're popular. Don't show up for a job interview or business meeting in a short-sleeved shirt. Formal and business attire always include long sleeves and a tie. Your belt and shoe color should match. Make sure your shoes are comfortable or you may have an unusual gait that others will notice. Keep your shoes in tip-top shape by polishing them regularly. A shoe tree will help keep less-worn shoes keep their shape. Only lace-up shoes are appropriate with a suit. Save the boots for leisure. Your socks should match your shoes. Your tie should reach the top of your belt. Wear a belt that fits. The prong should fit into one of the middle holes, not the first or last one. Do not wear a belt AND suspenders at the same time. Apply cologne before getting dressed to avoid any direct stains. Remember, good posture adds height and self-confidence.